Earth Rose Herbals is a small batch, high quality botanicals business founded in 2013 by “Red Rose” Patton, a military wife, mother, farmer, and herbalist. After devoting many years to the mobile military life, Red Rose and her family found a spot to sustainably farm and settle on in August of 2017, just west of the Kentucky River in Tennessee. Earth Rose Herbals uses sustainably farmed or wildcrafted products from the Patton family farm and features the creams, lotions, and other high quality products of “Raven Rose” Knight whenever possible. ​The key ingredient in our natural products is love from us and Mother Nature. We hope you enjoy them! Jeff is a Shaman, Certified Practitioner of Reconnective Healing & The Reconnection, Reiki Master Teacher, Distance Healer, Tarot Specialist, and Life Coach. During healing sessions, Jeff synergistically employs ancient spiritual energy practices, quantum physics and sacred connectedness to effect profound psychic, physical, mental, emotional, and inter-dimensional healing. Working with Tarot Archetypes, esoteric imagery, numerology, and intuition, Jeff utilizes tarot cards to tap into the spiritual realm and to bring forth messages, predictions and guidance for his clients. Jeff imports hand-crafted tribal art and spiritual tools from the Shipibo tribe; an indigenous poeple along the Ucayali River in the Amazon rainforest. A legal adoptee of a Shipibo family in Peru, Jeff supports fair trade by selling Shipibo tribal handiwork in the U.S.. Money raised goes back to the tribe. Kelly is a psychic and strong empath, able to sense a client's emotions and physical pain. She uses these abilities to assist her clients in a 'laying-on-of-stones' energywork session, etheric field cleansing, and intuitive, mediumship, psychometry reading. During sessions, Kelly receives information from her own body as well as her Spirit Guides, and those of the client, to assist her. During a stone & crystal energywork session, cell memory cords and attachments are released, allowing more peace, comfort, joy and understanding to take their place. During an energywork session a client can have a number of experiences ranging from deep relaxation to emotional releases to astral travel and peeking into other dimensions. As you set your intent for your session or reading, it is Kelly's goal to help clients progress toward a higher level of balance and overall well-being. The healing benefits of Reiki and Crystals are infinite. Shannon's mission as a professional healer is to provide her clients with customized healing sessions to remove energy blockages, promote relaxation and promote balance within the mind, body and spirit. Fossils and Specimens from around the world! We can help you find just that right crystal, whether it's for the collection, beauty, or metaphysical properties. 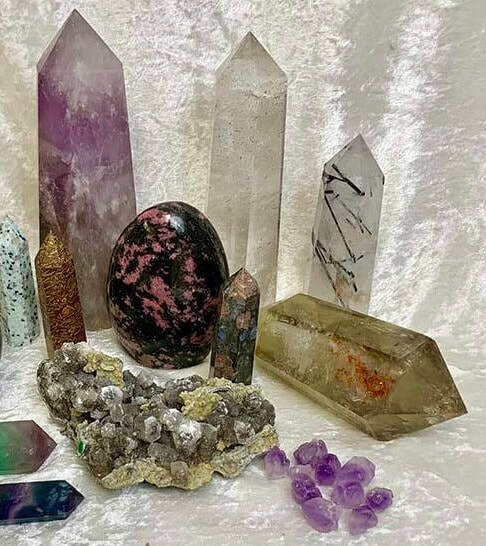 Metaphysical stones, crystals, citrine, amethyst, shungite, grounding stones, mineral specimens and more. Janna Phillips has “The Gift.” She comes from a long line of psychics, traced back through her Cherokee ancestors. From an early age she began experiencing psychic phenomenon: seeing spirits, having premonitions and experiencing visitations from spirits in her dreams. She learned to use her gift for the good of herself and others. Janna is a 4th generation psychic medium who has practiced mediumship and spiritualism for 25 years. She does Tarot card readings, flame readings and automatic writing, and works closely with guides and angels. She has channeled a book, Out of the Blue: A Psychic's Memoir and will be offering it for sale. 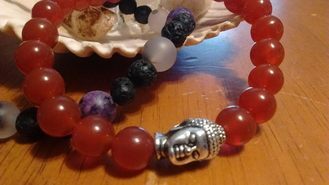 ​Samantha Mowery provides healing modalities that encourage the mind, body, spirit connection, such as massage therapy, tarot readings, & guided meditations. She also has over 50 hours in oncology massage training, and is a member of the Society for Oncology Massage, the international standard bearer of oncology massage practice and education. MORE to come.... check back often! Laura Djakpa is an international Spiritual Guide and Ancestral Shaman. She is gifted with a powerful awakened 3rd eye and strong spiritual awareness. Laura's divine sight and psychic abilities allow her to gaze into the unseen depths of the different spiritual Realms from the past, present and future. She is a true visionary. Laura's soul entered this world with a powerful mission to heal and to bring balance and harmony to those destined to encounter her on the life's journey. She has been embraces by many exceptional people of varied cultures and backgrounds Laura has visited many international locations absorbing the beauty of Mother Earth and honoring the sacred lands. These experiences have heightened her spiritual senses and provided her with the skills to nurture and empower others. Seated beside the wise Elders and Ancient Universal energies, Laura taps into divine higher consciousness in an effort to assist those who desire spiritual growth and healing. She focuses deeply on addressing the condition of the spiritual body and mind. She uses personal Spirit Guides and meditation to assist in conquering negative influences from the past. The Ten of Cups Metaphysical Store featuring the Higher Vibe Jewelry line. One of a kind sterling and find silver jewelry set with healing stones. Paul does readings by combining a unique blend of morphogenic and crystal energies. He does readings using a standard deck and spreads, or the Motherpeace deck and a unique spread for that deck. Paul is a Reiki practitioner and teacher of 15 years and practices both the Usui style and the Celtic style of Reiki. He is also a crystal skull caretaker. ​As a lightworker Marcia’s work is always of the highest vibration and integrity. When people vibrate to these higher frequencies, they feel better and are better able to learn and move forward in life. Marcia works to adjust the energy in and around the client’s body and raise the vibrations bringing body, mind and spirit into alignment. Marcia moves energy in a remarkable and distinctive way, assisting each client in removing physical, emotional and/or psychological trauma. Energy cords, curses, past life trauma, hexes and more are removed effortlessly through Marcia’s treatments. – Vesna hails from Bosnia with a strong gypsy lineage. Vesa uses pendulums, Tarot /Oracle cards, Beans, and Runes with spiritual insight, to give you a candid view of your situation and genuine guidance for your path. She provides you an honest and straight forward picture, as well as, potential solutions to your dilemma. She is well versed in the elements of candle magic, rootwork, gypsy magic, necromancy and more. Hippie Homestead was built on a long standing friendship. Carrie and Ellie fashions unique and useful items for home and body. The creative process is meditation for these ladies and they thrive on sharing the harvest. Home and hearth should reflect elements of style that resonate the simple complexity of the inhabitants. Promoting growth with live plants, and unlocking knowledge with pendulums, or capturing the spectrum with vivid tie-dyes...the ladies of Hippie Homestead cut, burn and dye items to captivate the eye. Products to nourish the body, and spirit within, skillfully crafted and packaged. Bath bombs, aroma rollers and aura cleansing sprays are designed to nurture self-care, making them great gifts for yourself and others. Amplify your energy with functional beauty. Hippie Homestead, because delight is in the details! Butterfly and Tree Jewelry is a small, local, hand-made jewelry business. We specialize in crafting unique pieces with love and respect for the materials borrowed from Mother Earth. Handmade Jewelry, Organic Body Butter, Fair-trade Silk Skirts and Pants from India. Nancy brings a magical essence to all the creations she makes. Presenting simple jewelry and art, wrapped crystals. Incense, sage and other new age products. Angel Radiance Candles began from a dream in 1996. "I had a dream we were living on top of a hill in the woods and had a candle company in the basement ~ this really excited me!" 20+ years later we are still pouring sacred Angel blessings into candles for Nashville and beyond. The different traditions in our life have allowed us to expand and serve a wider range of clients. In 2006 more new angels that were called forth to pour for this specific time on the planet. This includes the sacred line - Sacred Wisdom. It also includes the animal line and a line of transformative candles. We offer what we call special request candles poured and attuned for you, your family, your animals, your business and for what is in your heart. We are blessed to have many wonderful clients that we pour for regularly, some for many years, for their well being of themselves and their families. discovery helping you reclaim your Divine presence on Earth. I provides essential oil bath bombs, with and without CBD Oil infused. I also make knot blankets and diamond paintings, but am not limited to just these things. I focus on what feels good to the soul. I put positive energy in everything I produce to share with those I pass it on to. My diamond paintings focus on colors that motivate the mind and on spirit guide animals that can help with life meaning and transition. My overall business is about spreading positive energy to those around me and promoting moving forward in a positive light. My focus is to help people realize self-care is essential through the items that I produce. MORE to be added soon!!! ​Featuring Spirit Art Work - Psychic readings provided through spirit with a custom artwork piece live drawn for you to take home! ​Additional items available such as crystal jewelry, archangel smudge sprays, and crystal bath bombs! Debra Palermo is a gifted sensitive. Debra became attuned in Access BARS along with several other healing modalities over the past 5 years, after leaving corporate America. Debra made her spirituality a main focus in her life with the intent of freeing herself and those around her. Debra’s goal in working with you is to unlock the clarity of mind, body, and spirit. Brandt Graves is a psychic clairvoyant and natural medium. Brandt recognized his gift at age 7, after a near death experience. Brandt uses Tarot cards and guides throughout his intuitive readings. Brandt has worked 6 missing person cases and successfully solved 5 of said cases. Brandt’s goal in working with you is to turn pain into power and to help you recognize your very own intuition. Carole is an experienced Ataana Healing Method energy healer and teacher. The Ataana Healing Method is an advanced multi-dimensional system of healing. Activate your self-healing, enhance your spiritual development and experience this transformational healing work for yourself. Carole provides energy healing sessions and teaches the basic Ataana Healing Method 3-day intensive energy healer class in Nashville. She is also a regular guest on the podcast, "Let's talk Healing" with Ataana. Post traumatic stress, childhood sexual abuse, trauma bonding, Stockholm syndrome in relationship, suppressed communication, managing marriage, full-time career and children, narcissistic partner, divorce, career change, dysfunctional family patterns, relationship navigation. I have experienced all of these aspects in my life and found my freedom through the Ataana Healing Method. I can help you find your freedom, connect to Oneness Consciousness, and move forward in your purpose in life. No more shame, guilt, and pain. Connect with your higher-self and Oneness Consciousness and get back in the driver’s seat of your life. Available for conversation and book sales and signing! ​This book leads you on a path of identified inner demons, outer collisions into self-gratification, but yet full of wonder, and self development antics which lead you to a place where you have had enough of this character, and then in a minute you develop compassion and awareness. Full of sci-fi lore and sexual and lustful liaisons the author has developed the characters in an amazing fashion....where they all have self fulfilling purpose. Come check out the service providers and merchandise!